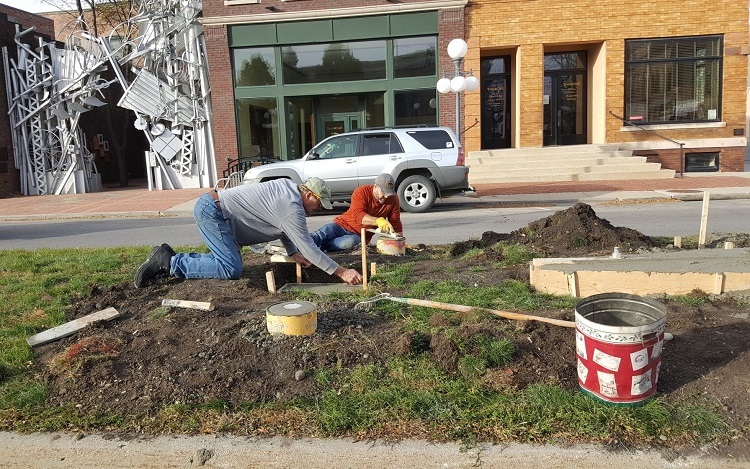 Des Moines artist Jim Russell and son Matt Russell braved the shivery election-day weather Tuesday to erect "Furrowed Fields," the fourth public artwork on the Willis Avenue boulevard. 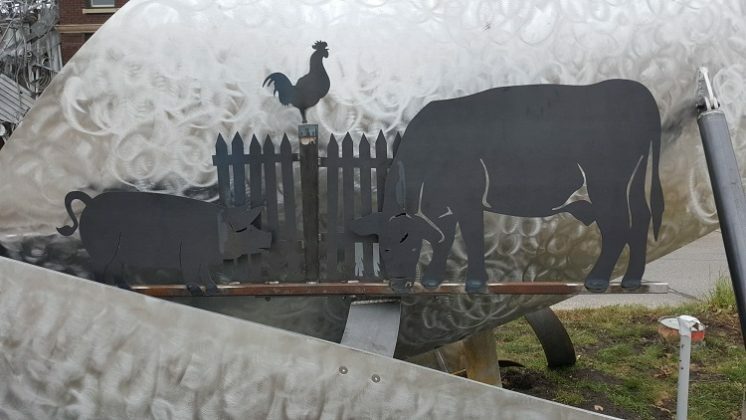 The sculpture celebrates Perry's agricltural roots. A silhouette of the Perry-area farmscape surmounts the stylized plowshare of Jim Russell's "Furrowed Fields." Cows, pigs and chickens browse by a picket fence in the nostalgic ornaments of Jim Russell's "Furrowed Fields." Des Moines artist Jim Russell oversees construction of the concrete footings Oct. 24 that now support the fourth public artwork on the Willis Avenue boulevard, "Furrowed Fields," a celebration of Perry's agricltural roots. 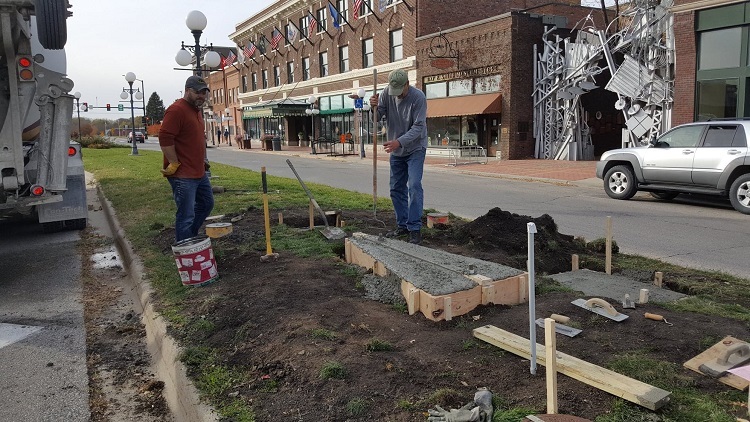 Des Moines artists Jim Russell, right, and Matt Russell prepare the footings Oct. 24 for the fourth public scupture planned for the Willis Avenue boulevard. 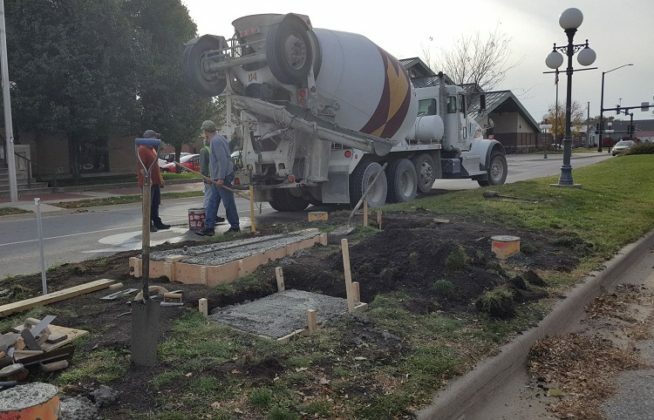 Des Moines artists Jim Russell, left, and Matt Russell prepare the footings Oct. 24 for the fourth public scupture planned for the Willis Avenue boulevard. Des Moines artists Jim Russell and his son, Matt Russell, braved the shivery election day weather Tuesday to erect their latest public artwork, “Furrowed Fields,” on the Willis Avenue boulevard. 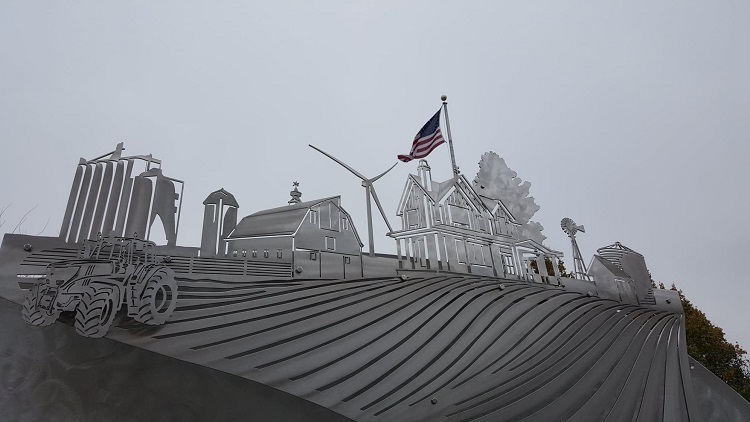 The sculpture, a large stylized plowshare, celebrates Perry’s agricultural heritage. The plowshare points westward and turns stylized soil. A silhouette of the Perry skyline surmounts the upper edge of the plowshare, with cattle adornments. The Russells poured the concrete footings for the king-sized plow share Oct. 24. 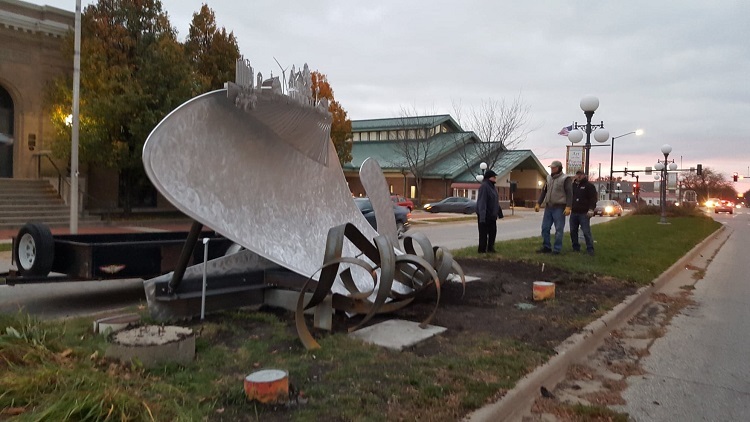 The sculpture will be dedicated during the ninth annual Art on the Prarie festival, which is “an arts festival which showcases over 100 Iowa artists, musicians and poets in 10 buildings in the Downtown Cultural & Historic District of Perry, IA,” according to the event’s literature. “Furrowed Fields,” a tribute to the men and women of agriculture and their immense impact on Perry’s history, will stand beside the three similar public artworks that celebrate the area’s history of manufacturing, railroading and philanthropy. The dedication and lighting ceremony for “Furrowed Fields” will by held Nov. 10 at 5:30 p.m. at Second Street and Willis Avenue. The event is free and open to the public.